Jewish Agency holds festive event at Ben Gurion Airport with hundreds of Olim who came in one day from France, Russia, Argentina and Brazil. 300 new immigrants arrived in Israel Monday from France, Russia, Argentina and Brazil. 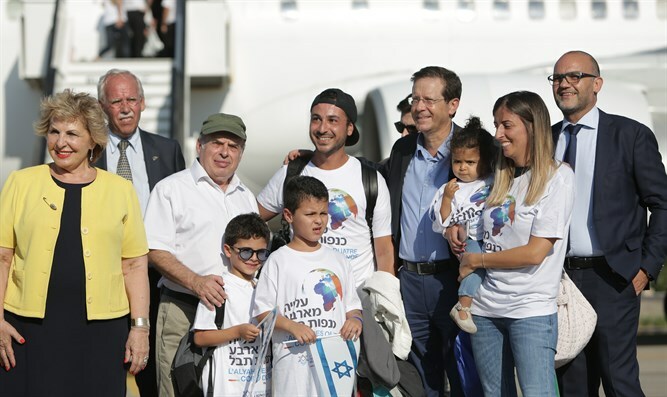 The Olim landed at Ben-Gurion Airport and took part in a festive event of the Jewish Agency marking the 70th anniversary of Aliya to the State of Israel. Hundreds of new immigrants from all over the world took part in the celebrations. About 700 olim in total participated in the ceremony. The ceremony was attended by the incoming chairman of the Jewish Agency, former opposition leader Yitzhak Herzog, outgoing chairman of the Jewish Agency Natan Sharansky, Minister of Immigration and Absorption Sofa Landver, Former Chief Rabbi Yissrael Meir Lau, Chairman Knesset Immigration and Absorption Committee MK Avraham Negosa, Jewish Agency Director Greg Meisel and donor representative Pim Vandrahoff. At the center of the ceremony was a special flight organized by the Jewish Agency. About 200 immigrants from France landed in Terminal 4, including some 70 children who will be integrated into the Israeli education system at the end of the summer vacation. They were joined by students and academics who also immigrated today from South America and Russia and will be absorbed in immigrant programs. The incoming chairman of the Jewish Agency, Yitzhak Herzog, said: "It is exciting to receive new immigrants in the State of Israel upon the opening of my term, and I hope that they will acclimatize quickly, that they will find a warm and loving home here and have a happy life in Israel. We can really rejoice in their joy." The outgoing chairman of the Jewish Agency, Natan Sharansky, said,:"Despite all the challenges today in Israel and despite all the slander against it, Jews continue to make Aliyah and the number of immigrants is rising from year to year. The 300 immigrants who came from all over the world on the day after Tisha B'Av are a guarantee that there will be no return to the past and the State of Israel will be even stronger." "This year we mark the 70th anniversary of the State of Israel, the land of unlimited possibilities in which everyone can break the glass ceiling," said Sofa Landver. "Here, in our common home, a new citizen can go far and succeed in a big way. The Ministry of Immigration and Absorption welcomes you and adapts itself to every new wave of immigration and its needs, in order to assist immigrants to integrate into society, to advance in the new life and to be absorbed in the profession and employment."